Melatonin is a hormone manufactured from serotonin (our feel good hormone) and secreted by the pineal gland. The human body is governed by an internal clock that signals the release of many hormones that regulate various body functions. 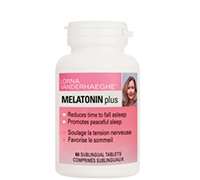 Melatonin is most well known for its ability to control our sleep-wake cycles. It is secreted in darkness and suppressed by the light. Melatonin is also used to treat jetlag. Children have much higher melatonin levels than adults and, sadly, as we age these levels dramatically drop. Anti-aging specialists believe melatonin is essential in slowing aging. Low levels of melatonin are also found in those with sleep and depressive disorders. A 2003 study found that melatonin has an anti-estrogenic effect on estrogen-receptor positive breast cancer cells. Further research in the Journal of the National Cancer Institute found that nurses who worked rotating night shifts 3 nights per month for 15 years had a higher incidence of colorectal cancer. Earlier studies had confirmed that night shift workers had higher rates of breast cancer but the colorectal study found melatonin also had an anticancer effect on intestinal cancers. Another study in Gynecology and Obstetric Investigation looked at 68 women diagnosed with endometrial cancer and 70 with abnormal bleeding. The researchers compared the women's blood melatonin levels and found taht there was 6-fold lower difference in melatonin levels in those with endometrial cancer. The researchers believe that declining levels of melatonin are a risk factor for developing the disease. In an interesting Spanish study, oral melatonin reduced the oxidative stress (lower lipid peroxidation and increase anti-oxidative enzyme activities) induced by strenuous exercise. The authors reported that the reduction of oxidative stress, combined with the inhibition of inflammatory markers, reduced muscle damage. In a 2011 study, low plasma melatonin levels were found to correlate with age-related high frequency hearing loss. Low melatonin levels are also correlated with severity of acute pancreatitis. It has further been suggested that melatonin supplementation may improve sperm quality and lower blood pressure in people with metabolic syndrome. Studies show that B12 causes an earlier release of melatonin at night which resets the sleep-wake cycle. B12 acts directly on the pineal gland to provoke a faster release of melatonin. Research has also shown that B12 helps you get to sleep easier and sensitizes you to morning light, which helps you wake up feeling refreshed, especially in the elderly who often have sleep problems.